This epic, 100-foot waterslide sits in Ohiopyle State Park on the southern side of the Laurel Highlands. Unlike some of the hidden waterslides on this list, you can actually find Meadow Run on Google Maps, with a full parking lot. 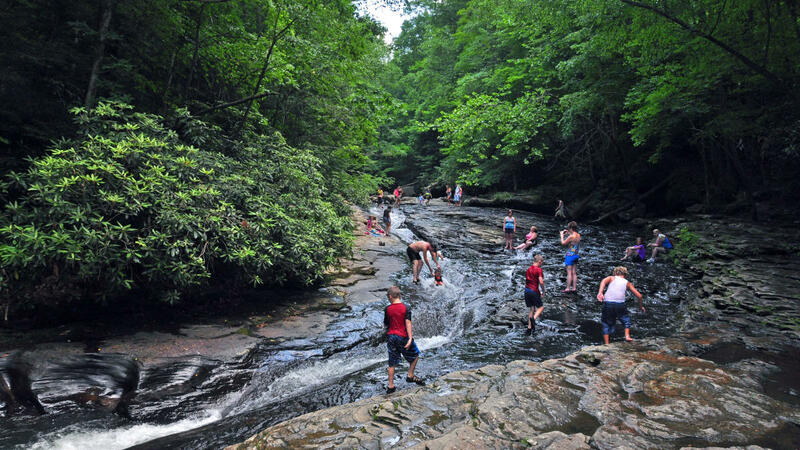 If you want more of a hike, start at Cucumber Falls on the main trailhead, and after about 2.8 miles of easy trekking, you’ll find the enormous, winding, sandstone slide running through a gorge. Even on its busiest day, the vastness of the area means it never feels too crowded. Check the water level before you go: If it’s too high, it can be fast and dangerous. Leave the skimpy swimwear at home, though. This isn’t a super-smooth ride, so opt for shirts and sturdier shorts -- or call up 1994 and ask for your cut-off jeans back.